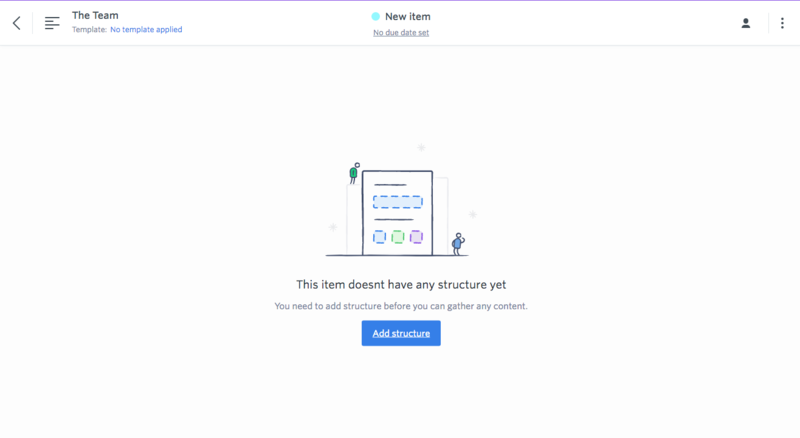 Here's how you can add structure to your items in GatherContent. An item needs some structure before you can add content to it. Once you’ve got some items in your project, you will need to add structure to them. Adding structure to items is essential as it enables you to add content to them. Structure vs a template - What's the difference? The process of creating structure is essentially adding different content input fields such as text fields, asset fields, radio button fields and so on to create the basis of the page or component that you'll be gathering content for. Once the structure has been created, these fields will are used to provide the relative types of content being added. An item can have a 'custom structure', which is a specific structure that exists only on that item, or the item can have a template applied to it. A template is a saved structure, which can be easily applied to other similar items. An example of this would be having a structure saved as a template called 'Blog Post', which contains all fields needed to capture content on a typical blog post page. The benefit of saving structures as templates is that you can very easily apply the template to items that need the same structure. 1. Open a blank item (without a structure or template currently applied). You'll see a button telling you to 'Add structure'. 2. Click the 'Add structure' button and you'll be taken into the structure editor. Please note: If you plan to migrate content to your CMS using one of our integrations, your items must use Templates. Custom structures will not be recognised when creating field mappings. Tip: If your structure has lots of fields, try to distribute them over multiple tabs to reduce the page loading speed. You can also duplicate a tab in your structure. 4. Save the structure by clicking the 'Save structure' button. You've now saved the structure and have applied it to this item, so you can now add content to it! 5. Navigate to the Content tab, and select your item using the checkbox. 6. From the Actions dropdown button that appears, select 'Apply a Template'. 7. Select your template from the list and click 'Apply Template'.